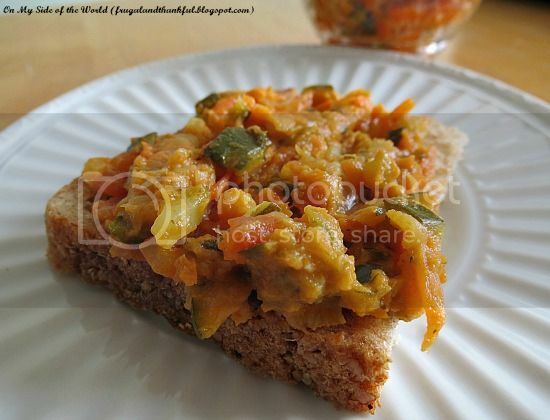 Frugal and Thankful: Vegetarian zucchini spread. For the past few weeks I've been craving something from my childhood. 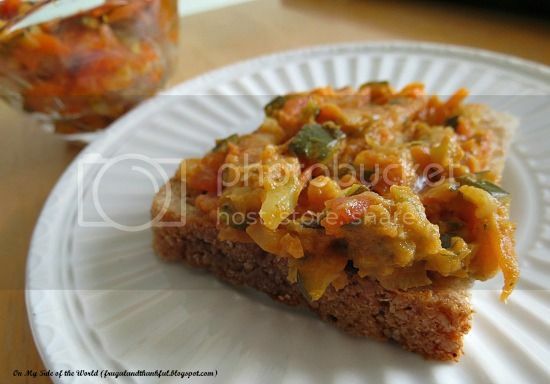 In fact, it was something that I hated as a kid but now just can't get enough of... and that is vegetarian zucchini spread or ikra in Russian. But last week I scored some zucchinis for less than a dollar a pound and decided to finally satisfy my cravings and share it with you too:)It's such an easy dish to make. 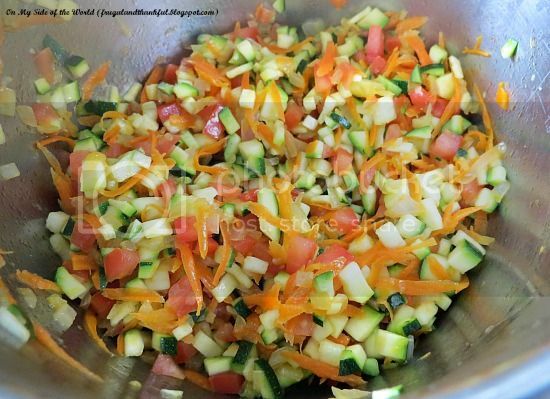 All of the vegetables in this recipes should be chopped as small as you can if you want to have a chunky spread. If you would rather have it all blended, than it wouldn't matter as much. 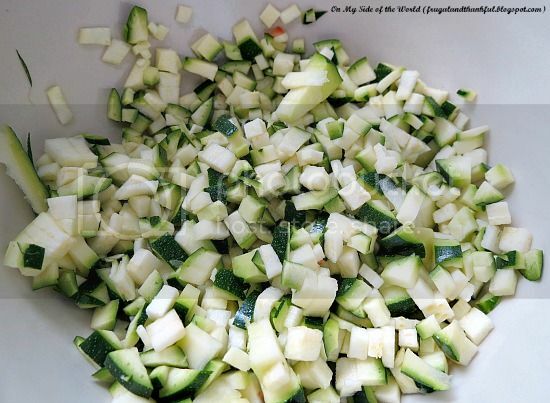 Chop zucchinis. Sprinkle with a pinch of salt and set aside. Now cut onions. In a cooking pot reheat a couple of tablespoons of vegetable oil on medium heat and cook onions until soft, for about 5-7 minutes, stirring occasionally. In the meantime, grate a carrot. Add it to onions once they are done and cook for another 5 min. Seed and chop a tomato. 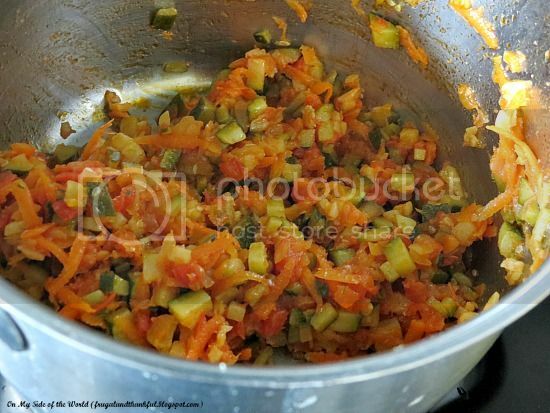 Drain liquid from zucchini and add both tomatoes and zucchini to the pot. Sprinkle sugar over and mix together. Cook on med-low for 30 minutes stirring occasionally until zucchini is soft. Then add tomato sauce and cook for 10 more minutes stirring often, so it wouldn't burn. Crush garlic into the pot and cook for another minute or so. Remove from heat. Cool down a bit. Now you can either use a potato masher to make a chunkier spread or put it through a food processor for a smooth consistency. I prefer me some chunky stuff but it's delicious either way. Spreading this on bread is a good idea and there are so many variations that you could make that are suited to your individual tastes. You've got me thinking. Zucchini is pretty cheap around here so I buy quite a bit - I'll try to remember to try this recipe next time I have some hanging out in my fridge. It truly looks delicious and uses ingredients I usually have on hand.